(Okayama, 30 October) RNA interference experiments identify crucial genes and proteins behind the processes that regenerate amputated cricket legs, report researchers at Okayama University and The University of Tokushima Graduate School. “The two-spotted cricket Gryllus bimaculatus has a remarkable regenerative capacity to restore a missing distal leg part,” say Hideyo Ohuchi, Tetsuya Bando and Yoshimasa Hamada and their colleagues in their recent paper. However, as they continue to explain, the mechanisms behind regeneration “remain elusive”. Their latest research identifies key genes and proteins involved in these epigenetic changes that allow regeneration to occur. Following the loss of a leg the cricket develops assemblies of cells that can differentiate into various different types to restore the lost part of leg. A similar process occurs in other regenerative animals including flat worms, insects, fishes, frogs, salamanders and newts, but the processes involved in the dedifferentiation and redifferentiation of cells during the regeneration of leg tissue are unknown. It is largely understood that epigenetic changes – heritable changes in gene expression that do not derive from changes in the DNA sequence – are responsible for the processes in regeneration. Epigenetic changes can occur through chemical modifications of amino acids, such as methylation or demethylation on the histone H3 lysine residue 27 (H3K27), which can repress or promote gene expression. In previous work Ohuchi, Bando, Hamada and colleagues identified the expression of several epigenetic modifiers that were enhanced during regeneration. They now focus on the two genes Gb’E(z) and Gb’Utx. Using RNA interference (RNAi) the researchers produced crickets with expression of either Gb’E(z) or Gb’Utx genes suppressed. When they amputated legs from these crickets the legs regenerated with either additional leg segments (Gb’E(z)RNAi) or defective joints (Gb’UtxRNAi). They link the effects to epigenetic changes by the genes through methylation and demethylation of the protein histone H3K27me3. “This report provides a clear contribution to an understanding of the epigenetic regulation of gene expression during tissue regeneration,” conclude Hideyo Ohuchi, Tetsuya Bando and Yoshimasa Hamada and their colleagues. Chemical changes to proteins can enhance or repress gene expression without any changes being made to the DNA sequence. These chemical changes include methylation, acetylation, phosphorylation and ubiquitylation, of specific amino acid residues in histones - a type of protein. Histones are highly alkaline proteins that are responsible for the packing of the extremely long DNA molecules into more manageable structural units. An example of epigenetic changes can be found in histone H3K27, which refers to the lysine residue 27 of histone H3 and is known for repressing expression of neighbouring genes. Demethylation of the trimethylated histone H3K27 (H3K27me3) counters this effect, promoting gene expression. The two-spotted cricket Gryllus bimaculatus is a hemimetabolous insect, that is, it undergoes incomplete metamorphosis and has terrestrial young that resembles the parent. The cricket has six legs made up of six segments referred to as (from nearest the body to furthest) coxa, trochanter, femur, tibia, tarsus and claw. The researchers focused on the function of the two genes Gryllus homologues of Enhancer of zeste [Gb’E(z)] and Ubiquitously transcribed tetratricopeptide repeat gene on the X chromosome (Gb’Utx), which regulate methylation and demethylation of histone H3 lysine 27 (H3K27), respectively. Regeneration defects have been observed in other organisms when the gene responsible histone H3K27 demethylation was silenced. When a leg is amputated dedifferentiated cells form in a ‘blastema’ at the wound. Several factor proteins involved in epigenetic changes are upregulated in the blastemal cells. 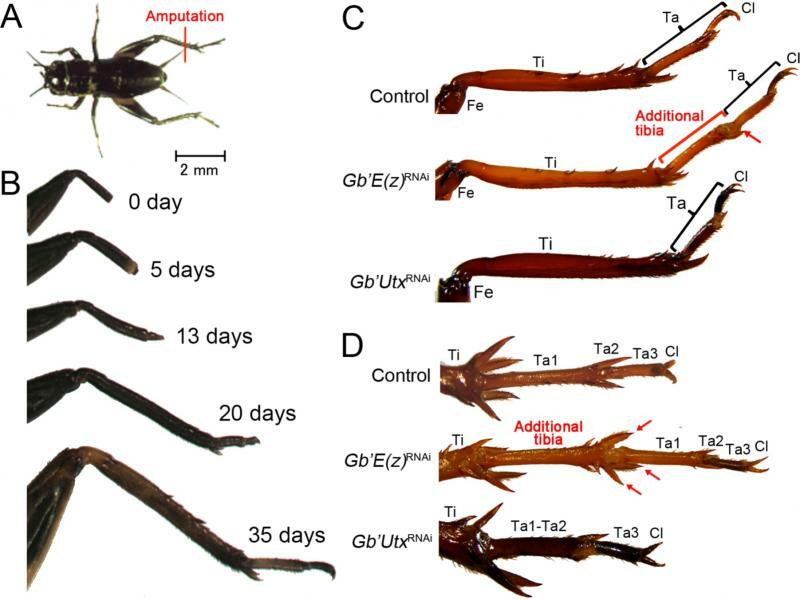 Silencing the gene Gb’E(z) led to form an additional tibia leg segment when an amputated leg was regenerated, whereas silencing Gb’Utx led to joint defects in regenerated legs. Gb’E(z) and Gb’Utx epigenetically regulated leg patterning genes involved in regeneration. Silencing the Gb’E(z) or Gb’Utx caused misexpression of leg patterning genes that led inappropriate leg regeneration. Yoshimasa Hamada, Tetsuya Bando, Taro Nakamura, Yoshiyasu Ishimaru, Taro Mito, Sumihare Noji, Kenji Tomioka, and Hideyo Ohuchi. Leg regeneration is epigenetically regulated by histone H3K27 methylation in the cricket Gryllus bimaculatus. Development (2015) 142, 2916-2927. Assistant Professor Tetsuya Bando, Ph.D.
(B) Cricket leg regeneration process. (C-D) Typical regenerated leg phenotypes in control, Gb’E(z) RNAi, and Gb’UtxRNAi crickets. Tarsus is indicated by bracket. The additional tibia segment and its spurs are indicated by the red bracket and red arrow, respectively.